Smartphones and tablets (PDA's) could only be used with a stylusÂ onceÂ upon a time, now we have very nice capacitive screens but the need for a stylus is not completely removed, you can draw, write, or just use the device without the need to use a finger... but finding a good stylus and certainly one at a good price is not easy at all, as I found out. Then a company called MediaDevil approached me (on twitter) to tell me about a stylus they offered, the MagicWand, I did someÂ researchÂ and decided to take a look at one, here is my views. The stylus is shaped like a pen, slightly larger than your average biro but it sits well in your hand. Â It comes in a fairly wide range on colours, as you will see from the images below, I have a red one. As with most capacitive stylus the tip is not like you would expect from a pen or an old fashioned styli, it has a flat round tip which has a fairly large surface area, this is generally required for capacitive styli to work, but has some draw backs that I will come too soon. Â The tip is of a soft material so it shouldn't harm your screen (but at the same time, you can still use it with a screen protector). Due to the nature/surface area of the tip it makesÂ accurateÂ drawings and handwriting a difficult task, a lot easier than with a finger but not accurate enough for most handwriting software (certainly not like using Samsung's S-pen on a Galaxy Note device), it will be more at home for general navigation and games, especially if your unable to use a finger e.g. while wearing gloves. A lanyard is included that can be removed if you do not like it. 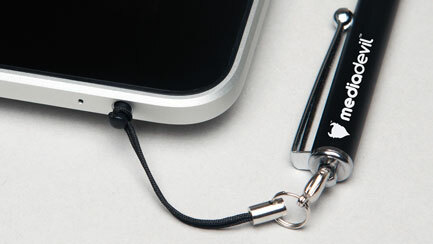 Â This is quite a nice idea, one end of the lanyardÂ attachesÂ to yourÂ stylus, the other clips into the headphone socket of your device to reduce the chances of you losing it, or leaving it somewhere unintentionally. Â Personally I removed it, but I can see it being a useful feature for some people. Where to start, MediaDevil (in my short time dealing with them) have shown the signs of being possibly the best, or one of the best companies of its type in the industry. Â When I started to ask about stylus on twitter I was contacted by the CEO of the company himself, he told me how he set the company up to do things the right way, and it seems he has certainly done that. Â Everyone seems friendly, quick to sort out any issues or answer any questions and they even send out sweets with their products! Â Everything I have seen is of high quality and of a reasonable price. Â I stronglyÂ recommendÂ you give them a try. This may not be the product for you if you are looking for aÂ stylusÂ that will be perfect for handwriting and detailed drawings, for that your only choice will be to buy one of the top end models which usually start at around Â£45 and can go up very high in price. Â If you like dealing with friendly companies and want a product you can trust and use for general purposes then for the price of the MagicWand you cannot go far wrong. I am informed that they have a second generation of Stylus out soon, if I can get my hands on one I will do a follow up review to talk about the changes etc.